Take it from someone who’s been doing it for a while: Marketing today isn’t easy, thanks to many logistical and technical challenges, including today's topic: orphan leads. There are many challenges to tackle - some quantitative, some qualitative, some technical. Marketers frequently struggle with a “leaky funnel” when their marketing funnel has inefficiencies that causes them to miss out on opportunities. In some cases, marketers’ attribution models - the way they record specific touchpoints with leads - fail, which makes them unable to properly figure out which parts of their campaigns worked and which didn’t. Sometimes there are logistical problems and delays with lead qualification and hand-off to sales that cause seemingly hot leads to go cold. Even issues that seem like minor technical challenges can become substantial obstacles between you and your never-ending goal of capturing high-quality leads. To start, we’ll discuss a specific technical issue that plagues many marketers: orphan leads. By way of background, from a technical standpoint, a marketer’s life is frequently A Tale of Two Marketing Stack Components - namely, your marketing platform, from which you plan and execute all your marketing programs, and whatever else you’re trying to interface with, such as your source-of-truth database, your email service provider, or even your customer messaging platform. Ideally, your stack components are always talking to each other, such that updating data in one application updates them in the other. In a perfect world, you wouldn’t just have a bi-directional sync that goes both ways between your marketing platform and one other engagement application. In a perfect world, you’d have a tri-directional sync that connects your other marketing applications to your marketing platform, as well as to your CRM (or other customer database), ensuring your records are up-to-date across the board, and priming you for instantaneous handoff of hot leads to sales. In the real world, this doesn’t always happen. Surprisingly enough, this is actually where customer messaging platforms such as Intercom can come into play. This powerful application is commonly used by customer service teams to conduct 200 million customer conversations every month. And it also has significant applications to marketing, especially when connected to the rest of your sales and marketing stack via Tray. Even when you’ve got a hot lead engaging you on your website, you may still end up with a de-sync that causes that lead’s info to fail to properly appear or populate in your CRM, marketing platform, or other source of truth. When this happens, the lead becomes “orphaned,” meaning they exist in one location, but are not synced to the rest of your stack where you need them, such as in your marketing platform or in CRM. Orphan leads can be costly to your business. They break up your marketing-sales flow and effectively end up delivering opportunities to your sales team that are devoid of context, and put them one step behind the curve. As the sales pro, you receive a sales-qualified lead from marketing belonging to a highly desirable account: Joe Schmoe, Executive Director at Fortune 50 Company, Inc. This lead was marked as having directly engaged with your website’s customer messaging program - so you know there’s real interest here. This is a hot lead that came directly from your company’s website messaging platform, spilling their guts about their pain points, using their own words. You have full chat logs from this instance, and any previous instance, of this lead using your website’s customer messaging platform, loaded into your CRM database and ready to access. Armed with this context, you’re ready to dive into a conversation with this lead and directly address their use case and business needs. And that’s it. That’s all you know about this lead. As the sales rep, which lead would you rather get? As you’ve already guessed, the lead in the first scenario is much more likely to convert to a closed-won deal. The lead in the second is an awkward piece of contact info, devoid of contact. Why did this lead engage with the website? Are they interested in buying, or simply on a fact-finding mission? What are the details of their use case? As a sales pro, you’re happy for the hot lead from the big account, but where do you start to have any shot at a successful conversation? You can hopefully see why orphan leads are a problem. Let’s go over how you can intelligently use Intercom with Tray to make sure they become a thing of the past. 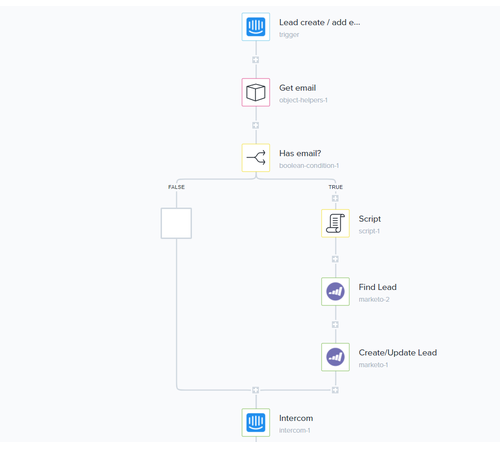 Create a new workflow that triggers when an email address is captured from an Intercom chat window. Pull up that contact’s email from the chat window, confirming that the contact has an email on record. If the contact does have an email address on file, make a Marketo API call to find that lead in the marketing database. If that contact does not exist in the Marketo database, create a new contact. If the contact previously existed, update the existing lead information in Marketo. You can also then flawlessly add any Intercom sessions into the marketing history of any lead, complete with lead source, to give you a clearer picture of your lead’s ongoing marketing journey as they get more warmly acquainted with your company on their journey to becoming sales-ready. Hopefully, this article has given you some ideas on how Intercom in specific - and customer messaging in general - can provide value not just as a customer support tool, but also to provide more value to your company for marketing. Please request a demo to learn how Tray integrates applications like Intercom, along with marketing automation, CRM, and other key components of your tech stack, to eliminate lost attribution data and help you capitalize on powerful advantages for marketing and sales.